OK!, now the very first thing you should know is that you have to follow every step exactly as mentioned. Go to this CodeAnyWhere Registration Page, and enter your Email and Password. After you register, you will be redirected to a page like below. On that page you will see a popup like the one in the image. Just click on the last tab (“Digital Ocean” tab) of this popup (bottom left). Now all you need to do is to click on the “Get Coupon” button and you will see a coupon code generated for you. Note down this coupon code some where as they don’t allow to copy it (though smarter people can still copy by right clicking on it and choosing “Inspect Element” from the menu). This coupon code will be worth $25 of Free Credit. Use only and only THIS LINK to create a new Digital Ocean Account with $10 free credit. First you will be required to confirm your email so just do that first. Now you will be required to use either your Paypal Account or Enter Credit Card. Just enter a credit card if you don’t want to pay even the $5 initial amount (you won’t be charged the $5 n your credit card for now). 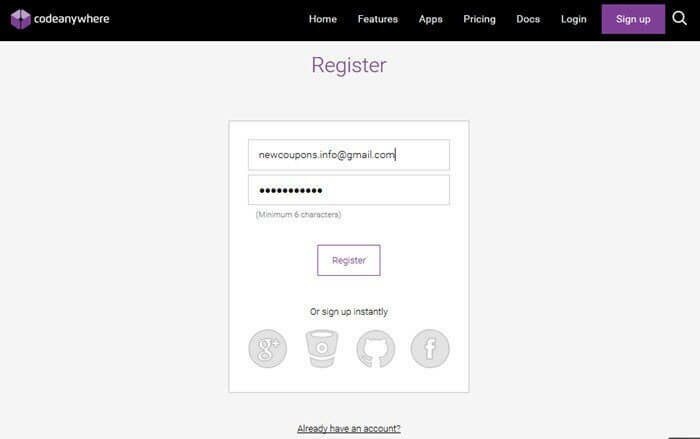 Note that there will be an option to enter the Coupon Code but don’t enter you CodeAnyWhere coupon code already. You will need to enter it later only otherwise you won’t get $25 extra credit. 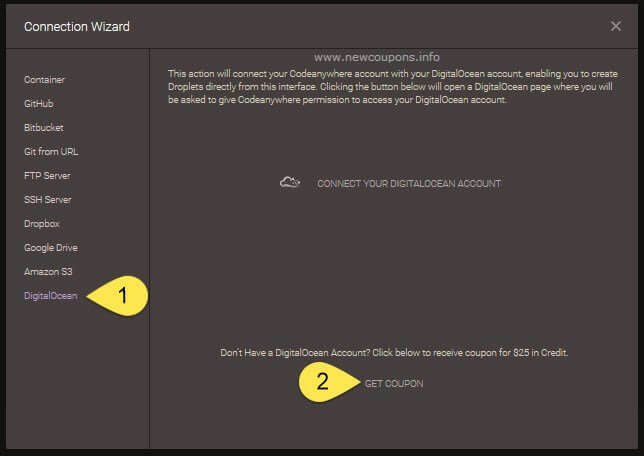 Goto DigitalOcean Settings -> Billing -> Promo Code. Scroll down to the section that says “Promotional Codes” and enter the CodeAnyWhere $25 Coupon Code that you had noted down in the Step-1. And Voila! There you have $35 of free credit in your very new Digital Ocean Account. Use it smartly. And let me know in the comments section if it works for you or not.